Carlos has been honored by the invitation of the National Concert Hall in Dublin to celebrate St Patrick’s Day with a very special concert www.nch.ie . arlos feels at home at the Concert Hall, where he has performed in several occasions, one of his concerts was even attended by Irish President Mary MacAleese, who talked with Carlos and the band backstage after the show in perfect Spanish! 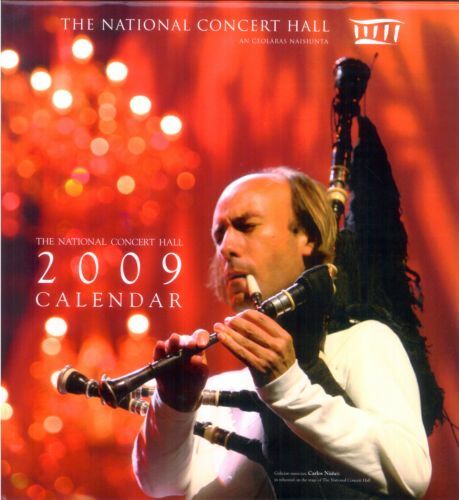 The Concert Hall has kindly chosen Carlos for the front page of their beautiful 2009 calendar. Friday 21 September Carlos will play at the Festival Ovale in Paris, because of the Rugby World Cup. The concert will take place just after the France-Ireland match, at the Village Rugbycolor, in Saint Denis, just beside the Stadium. Due to the general strike that started in Israel this morning, the Jerusalem concert has been postponed until a new date yet to be decided. Carlos and the band deeply regret this because they had a personal interest in doing this special concert and hope they will be able to compensate fans soon. Carlos has recently participated in the soundtrack to “Gedo Senki” (Tales from EarthSea), an animation movie from the legendary Studio Ghibli that has been a huge success in Japan. This is Goro Miyasaki’s first movie. Ghibli were so happy about Carlos’s participation that they even commissioned him to make a full album based on the movie and its soundtrack. It is called “Melodies from Gedo Senki”. The album will be presented next May 9 at Tokyo NHK concert hall. Carlos will have as special guests the great Akiko Yano, as well as Gedo Senki’s composer Tamiya Terashima and Aoi Teshima singer of the movie’s theme. Carlos is on tour in Japan at the moment. The tour is called “Image”, a concept that brings together musicians and their image related works, such as movie soundtracks or TV commercials. Carlos is the only non-Japanese artist on tour, surrounded by big Japanese instrumental music stars. Carlos will have his own tour in Japan next October.